Personal boundaries are guidelines, rules or limits that a person creates to identify reasonable, safe and permissible ways for other people to behave towards them and how they will respond when someone passes those limits. How do you keep an open heart, while also protecting your own well-being? 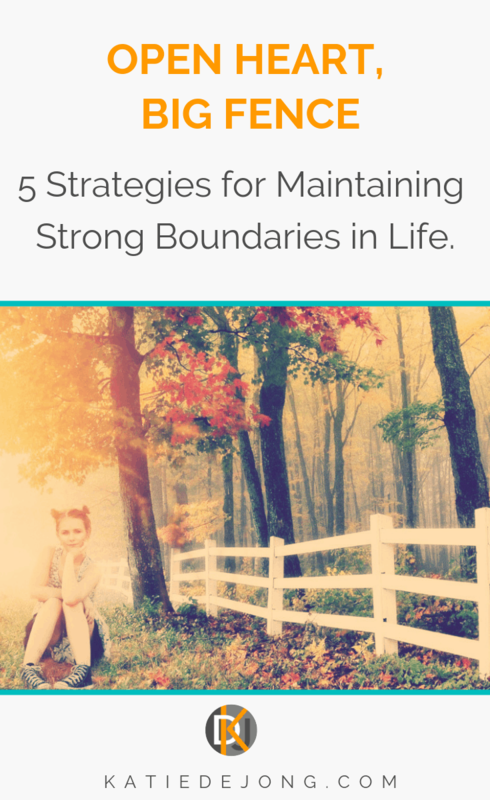 ‘Healthy boundaries’ is a term I only became familiar with in my thirties. Becoming aware of the whole concept of boundaries was a revelation for me, particularly when I realised that all my years of struggle, depletion, exhaustion, overwhelm, and anguish had been because I didn’t know that I was allowed to – and supposed to – have boundaries. I had always allowed the needs and desires of others to dictate my life. Somewhere along the way I had learned that it was not OK to put myself first; that it was more important to meet the expectations of others, and underneath all that… I felt that I was not worthy of putting my own needs first. I was so busy trying to be what I thought others wanted me to be that I actually didn’t even know what I wanted or needed – let alone have the courage to take a stand for that. Needless to say, that was not a joyful way to live. For the past 5-10 years or so I’ve been learning, albeit slowly and at times not so successfully, how to set boundaries in my life. Sometimes I’m really tuned in and I can take a stand for myself and my needs. And it feels great when I’m able to do that. To my surprise, those around me adjust quite easily when I’m able to communicate my boundaries effectively and lovingly. And it usually does them a favour too; it helps us all avoid situations that are likely to cause stress and tension when strong, clear boundaries are communicated and protected. It feels empowering to set a boundary and have it respectfully met. But there is definitely an ‘art’ to setting and maintaining healthy boundaries and I’m still practising it. 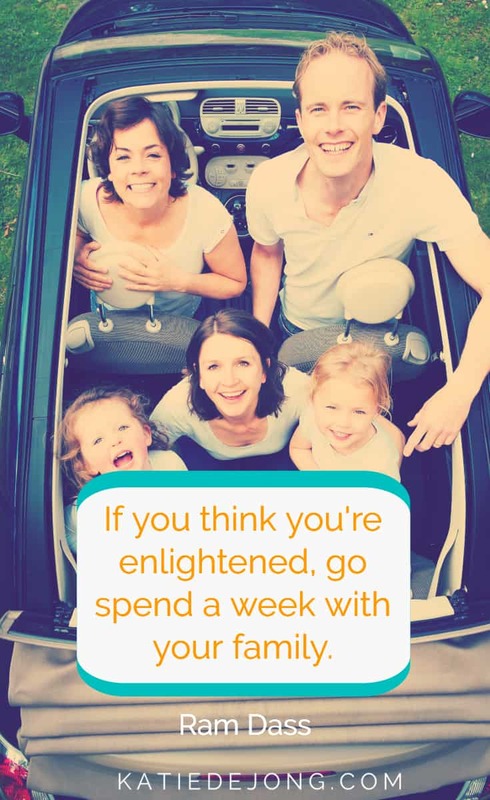 In recent years, I went on a holiday with extended family, and I experienced again what it’s like to let my boundaries be crossed and to lose control over my well-being because of it. There are some situations in life that we know are going to cause stress and tension. When we willingly put ourselves in those situations without clear and healthy boundaries, it’s guaranteed to cause trouble. My step-father calls those situations “putting your hand in the mincer”. That’s what I did – again – ugh. Why did I willingly put myself right in the middle of a tense and predictably difficult situation? I think because I had naively hoped that maybe this time things would be different; that maybe by now we’ve all moved on enough to be able to handle things differently. But childhood wounds run deep. Despite our best intentions to stay grounded and unaffected, certain family members can trigger us right back to our six-, ten,- or fifteen-year old self and before we know it, we’re behaving just as if we were that age again. If we haven’t been able to work through past family or relationship conflicts through therapy or fair, open discussions with each other, there’s always going to be residual pain in the relationship, just below the surface. Unless both parties have been able to work through the issues to the point where unconditional forgiveness is possible on both sides, the relationship will remain strained. I’m a big believer in always looking at our own role in conflicts and trying to understand how and where things have gone wrong in the past so we can do better next time. We need to try to understand what we can personally do differently and how we can be more effective at preventing stressful situations or conflicts in future. Perhaps there’s a difficult conversation we need to have to resolve an issue. Or maybe we need to work on our own preconceptions and judgements about other people and cultivate more loving acceptance within ourselves towards others. And yet sometimes we just need to accept that no matter how much we wish and hope that certain relationships could be different, the reality is that the most difficult ones may never change. It takes two people to build a bridge, and if only one is committed to working through the emotional pain to find resolution, the bridge will never be whole. We need to learn how to make peace with that and instead of always trying and wishing we could change things, the challenge instead is to learn how to manage these situations more effectively. How do you know if your boundaries have been crossed? In all these cases, you’ve let the other person’s needs, expectations, views, and judgements interfere with your own values and priorities. The way you feel around someone else can also be a big cue to strengthen your personal boundaries. Life coach Britt Bolnick says you should always “check your personal engine light” when you’re around different people. How does it feel in your body when you’re with someone? How does it feel in your mind? How does the presence of this person affect you? Imagine that your body is like a car, with a dashboard full of warning lights. You have your very own “check the engine” light for your personal boundary system. Your feelings are a security warning that your personal energy field has been breached, and you’re letting in stuff that isn’t yours. This is exactly what I unwillingly allowed during my family holiday. I was letting in all kinds of ‘stuff’ that wasn’t mine to take on. My personal boundaries were weak, unguarded or unclear, and I was giving away my personal energy unconsciously. 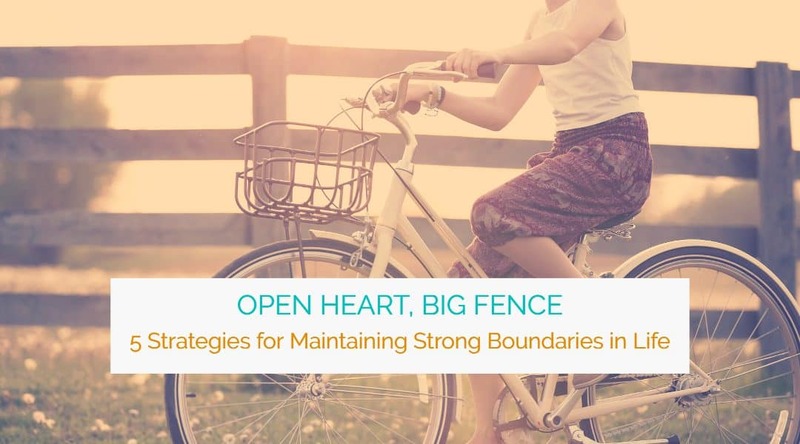 So How do You Set Stronger and More ‘Healthy’ Boundaries for Yourself? Here are my five tips and strategies to help you protect your emotional well-being in difficult situations. You can’t set healthy boundaries if you don’t know what your limits are. What is it that you need to protect yourself physically, emotionally and mentally? What is it that knocks you off-centre or leaves you feeling frustrated, overwhelmed, resentful or just plain irritated? What are you able to accept and tolerate, and what are the things that make you feel uncomfortable and stressed? Remember, feelings of stress and discomfort help you identify what your limits are. By making self-care your priority, it means you’re giving yourself permission to put yourself first – the first critical step to setting and maintaining healthy boundaries. When you recognize the importance of your own feelings and honour them through prioritizing self-care, your need and motivation to set boundaries becomes stronger. Putting yourself first also gives you the positive frame of mind and inner peace to be more present with people when you’re with them. And we all know that when we’re feeling happy and balanced, we can be a better wife, mother, husband, colleague or friend. If I haven’t made the time to do my yoga or swimming workout, I can become quite the grumpy mum and wife! No one benefits from me not taking care of myself and my needs. Even though you know intellectually that people are not mind readers, you still often expect others to know what hurts you. 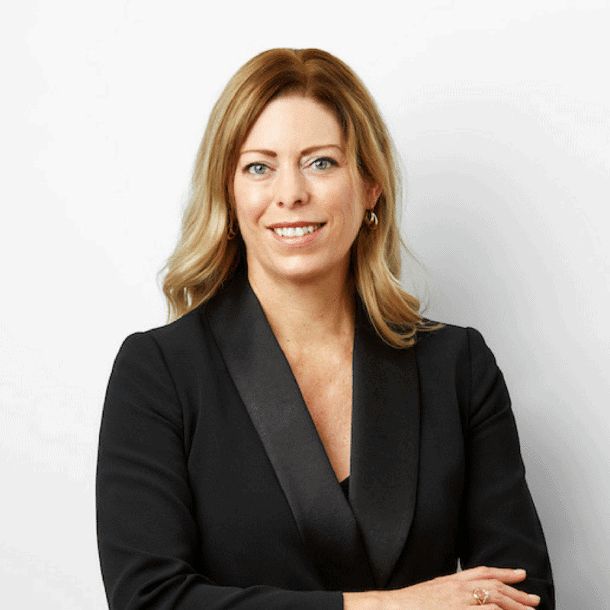 But since it’s most likely that they don’t know, it’s important to find a way to communicate clearly and effectively what you need from any interaction or situation. Being up-front about your needs and expectations and being able to communicate them clearly means there’s much less room for stressful situations to arise. In the past, I’ve sometimes been a little hurt by someone else’s assertiveness when fiercely protecting their own boundaries (and that was possibly because at the time I didn’t know that I was worthy of asserting my own boundaries). But afterwards I was often grateful for their assertiveness because when everyone’s expectations and needs are clear, it avoids all kinds of uncomfortable situations. Communicating your boundaries assertively is a skill and takes lots of practice. I’ve been practising for years now and given my recent difficult experiences I realise I’m still far from getting this right. 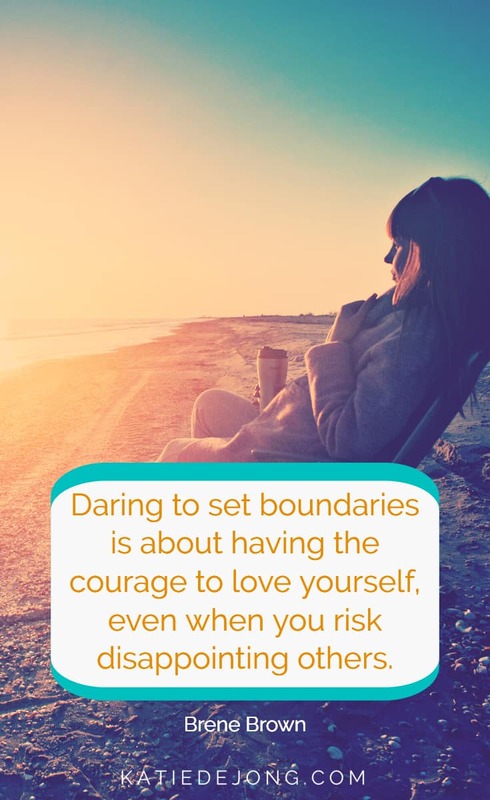 Setting boundaries takes courage, practice and support. It’s a skill we all need to practice and master. 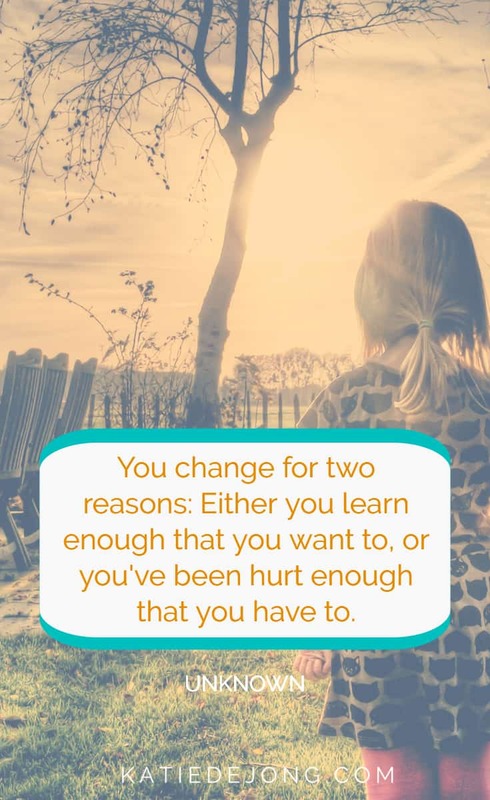 But it’s worth taking on the challenge to change, because when you’re able to set up and maintain your own healthy boundaries well, it’s a great feeling, for you and others. Grounding techniques can really help you maintain your boundaries. ‘Grounding’ is any kind of technique you use to nurture a loving connection with yourself and the space around you. Some techniques include visualising yourself growing long, deep roots into the ground, perhaps all the way down into the centre of the earth (I love this one). You can also use a grounding stone of some kind, such as black tourmaline or smokey quartz to help you ground your energy while you visualise yourself becoming deeply grounded. When you’re grounded, you don’t get so easily blown around in other peoples’ emotional storms. It’s a way of intentionally connecting with your own core and intuition. It helps you stand your ground and stay centred around people who tend to knock you off centre. Obviously it’s impossible to avoid all difficult situations entirely. But when you know you’re about to enter one, take a few minutes to ground yourself and then you could even imagine breathing a bubble of protective energy or light around you. Think of it as space that will only allow in love and positive energy and deflect anything else. Really see it and feel the force of it around you. This really works too if you believe it does. 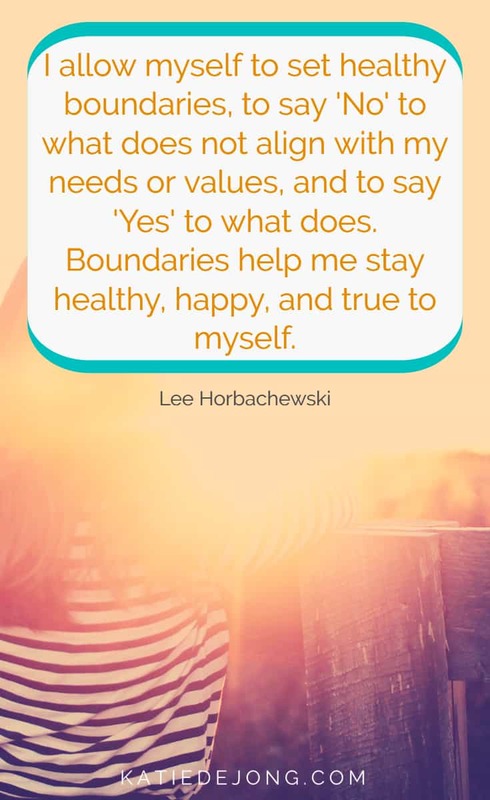 Healthy boundaries are all about getting to know yourself and your needs intimately. It’s about developing enough self-esteem to know that you are worthy of setting and maintaining your own boundaries. FInd out what is that you need to stay centered and balanced. Know the things that maintain your sense of well-being and comfort and fiercely protect those things. Don’t let other people’s expectations or your own naïve hopes stand in the way. If you’re not sure whether a certain situation will ruffle you, take the safe route and build in measures to protect yourself anyway. This is not selfish or unkind; it’s essential to avoiding stress and tension for everyone involved. So dig deep, have a chat with yourself and find out what you need to stay happy, balanced and grounded. And let me know if you have any breakthroughs in the comments below! Please share using the social media icons below if you loved this article.